On International Day for Sport Development and Peace colleagues of The Football Collective reflect on their experiences. For the past two-years we have been fortunate enough to travel and work with colleagues in Medellín, Colombia. These fieldwork trips involved engagement with the public sector sport and recreation department, Inder Medellín and local academic institute, Universidad de Antioquia. The fieldwork was funded by the British Council and most recently by Inder Medellín. During this time we were able to spend twenty days working with government departments, academics and community groups building our understanding of the role football plays in social good. The purpose of this article is to share some of the context and innovation observed. The article will raise questions for those in football development, public health, coaching, managers and policy makers. Medellín is a Colombian city and capital of the region of Antioqiua. It lies in the north-western region of the country in the centre of Aburra Valley in the Andes mountain range. The valley is crossed by the heavily polluted Medellín River and is a densely populated urban area, the second most inhabited city in Colombia. The history of Medellín has been troubled, in the eighties and nighties it was considered the most violent city in the World, with a murder rate of 381 killings per 100,000 in 1990. This symbolic nature of its recent past accompanied by programmes such as the recent Netflix hit Narco’s, which provides a United States DEA agents insight and perspective on the cocaine trade, has helped cement words such as crime, violence, drug cartels and murder very closely with the culture of Medellín. That said, Medellín cannot and does not try to avoid its past as once being home to South America’s most notorious drugs cartel, with 6,349 killings in 1991 alone (this was a rate of 380 per 100,000 people). On commencing our first trip to Medellín, accompanied by students, the risk assessment supported these notions of travel being high-risk, which meant (on paper at least) that there was a high risk of kidnap and terrorism. Indeed, arriving with our four students (who took on the apparent risk to join us), flying from Bogota to Medellín and then driving deep into the unknown helped create tensions and nervousness not felt before by the Dan and students. Pedro Pablo and Alexander on the other hand was more excited about visiting Medellín, the envy of Colombia. These outdated impressions were pleasingly rebuffed during our first visit. Moreover, our experiences of Medellín, working officially and exploring the city by day and night, could not be further from the this perception. Here, we were extended a warm welcome from our host, our colleagues and from the people we met in the communas (communities) who shared their insight, experiences and perspectives on politics, public policy, education and sport, especially the national game football. Despite sport and recreation playing a huge role in regeneration, some of which Dan has written about in an article for The Conversation, Colombia has experienced the longest-running internal conflict in the Western hemisphere. For over 50-years government forces, guerillas and paramilitaries have been in confrontation. This confrontation has recorded 220,000 deaths between 1958-2010, a displacement of 5.7million people, 900,000 assassinations and much more, which you can read about here on a blog post by Alex. The city is also renowned for its cable car system – we joined quite a few tourists in Santa Domingo; which links communities in the hillside to the metro and city centre, helping build the interconnectivity of residents of the communas across the city. This infrastructure involves public spaces, libraries, escalators into the hillside of Commune 13, which also have outreach schools and police stations. This innovation also includes, Commune 4, where a mountain garbage site was converted into a public park, to the most recent Parques del Río Medellín, which has been labelled the cities boldest yet. Alongside this urban and community innovation we were able to enjoy a glimpse into the everyday life for people of the paisa region, who appeared to enjoy this new change and passed tradition. Including the formidable bandeja paisa – a meal of fried pork, lots of crackling, lots of beans, eggs, black pudding, maize buns and plantain. Beyond gaining insight into traditions of the paisa, we also received an extensive insight into the sport operations across the city and how sport and football was being used to help shape regeneration and social good in the city. Football has been a key part of the history of Medellín. Two of most high profile names associated with football historically in Medellín is the Escobars, Pablo the drug cartel kingpin who maintained a close relationship with professional and international footballers in Colombia, and Andrés, the Colombian World Cup 1994 player who was tragically murdered. Recently however, during the last World Cup in Brazil (2014), Colombia shined on the world sporting stage. The football pitches that somehow ascend from the environment, are in fact a new urban intervention located in the heart of neighborhoods of the city for communities to engage in healthy physical activity and recreational sports practices; cultural events and promoting opportunities for community participation (civic engagement). These are called, life units and emerge from the neighbourhoods as huge concrete football pitches, yet they are also colourful, clean, powerful structures, typically covered with an assortment of pitches. The football pitch is just the symbolic vision, these sites are undoubtedly a community-led initiative and asset. Looking below the surface, under the roof-top football pitch is layers of other activities and facilities. High spec gym facilities, childcare and play settings, cinemas, computer labs, teaching areas, community shop spaces, dance rooms, dj recording labs, swimming pools, water zones, basketball courts and below the above football oriented life unit – a full size futsal pitch pictured earlier. This sounds great, but the exciting thing is that these units are designed by the local community and entrenched with the environment of makeshift housing that surrounds them. Each community that receives a life unit, has a budget provided by the local authority (municipality) and can choose what activities and facilities they want to develop. An example of how Medellín ties in their communities sport and recreation to their city-wide sporting ambitions is the type of infrastructure they provide. Medellín recently replaced an underachieving bid city and will be a venue for the 2016 FIFA Futsal World Cup awarded on behalf of the Colombian Football Federation. This won’t come to a surprise to anyone in Medellín, or Inder Medellín who have been planning and delivering strategic and coherent sport and recreation, programmes, facilities and events for many years. As part of these ongoing intentions, Medellín have invested in Futsal courts like the one we visited below for their communities. This court is on a lower-level of the life unit pictured above (and has more seating than the Futsal facility in the national football centre in England – St Georges Park). The life units allow for local communities to meet, socialise and engage in different types of social, physical and sporting activities. For many local communities this is ‘their space’ that the local communities own and take responsibility for the management and sustainability of the centre. The life units have high quality sanitary facilities and access to water fountains, for those that did not opt for the development of a swimming pool infrastructure, which was very expensive, this could be their major access to flowing water for play or to cool in the often intense heat. Putting the football facilities to one-side, an integral part of these incredible facilities is that the life units house medical support services such as general practitioners and limited accident and emergency alongside a range of health and social care services for local communities. This is all incredible, but the most astonishing thing about all of this public/state funded activity is that is is all freely accessible to the local community – there is no charge for use or entrance. Whether you are playing football, using the computer labs, recording a demo tune, watching the cinema, borrowing a book, taking part in dancing – there is no charge. This entire venture, is a result of a collective community where local people, communities and organisations in the city, under the leadership of the local authority or municipal administration, who provide expertise, investment and knowledge for the consolidation of public spaces help create integrated multipurpose, inclusive and innovative environment. Medellín is one of the most incredible places we have ever visited. The people, the nature, the geography, the climate and the football. Football is front-line and centre as a means to bring together communities for physical activity, peace and public health. With the life units costing in the region of millions of US dollars, all resourced by public funds, it is exciting to watch the city local authorities/administration working in collaboration to continue to innovate the city, in this very innovative approach. 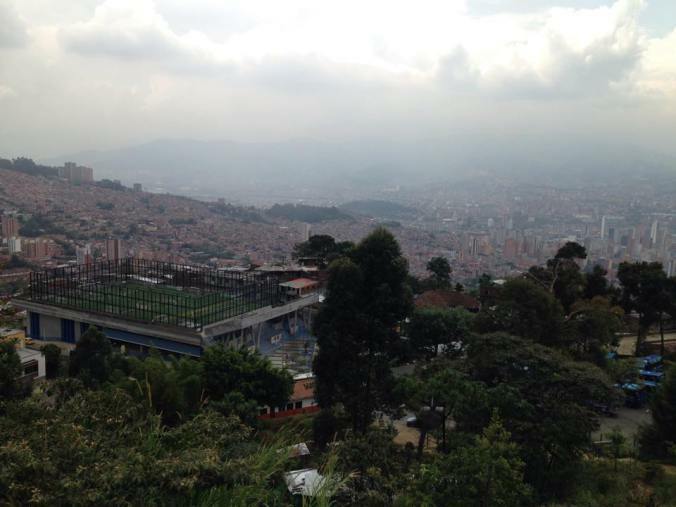 For those interested in football’s role for social good, Medellín is most certainly a place to research and explore further. Moreover, it is a place eager to explore and incorporate new approaches too, tackling social issues and develop whether in sport development and peace, sport management, coach education, sport and social change, or research and evaluation. To contact Dan on email: d.parnell@mmu.ac.uk or to link up on Twitter @parnell_daniel. You will also find more about Dan here on his University profile and his other research on Academiaedu. To contact Pedro Pablo email: p.p.cardoso-castro@leedsbeckett.ac.uk You will also find more about Pedro Pablo here on his Linkedin or his other research on Academiaedu. To contact Alex contact email: alexcarmen@yahoo.com. You can explore more of Alex’s work on his Linkedin page.